As our customer, we welcome you! 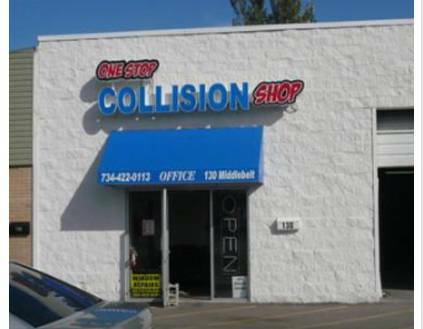 At One Stop Collision Shop, serving Westland, Dearborn Heights, and all of Wayne and Washtenaw Counties, you can expect to receive the finest quality repairs available. These repairs are made possible only by our continued dedication to the collision industry. As a member of the business community, we adhere to a strict Code of Ethics, and pledge to always maintain a high level of honesty, integrity, safety, and craftsmanship. You may have some questions concerning the estimating/repair process. This website was designed with those question in mind, but feel free to call us or stop by if your questions are not answered here. Our trained professionals are ready and willing to help you in any way they can. For us, satisfying the customer is the most important goal we can achieve! Working to keep our shop equipped with the technology needed to fix today's complex vehicles. Keeping our technicians up-to-date through on-going training. Striving to meet standards of top quality paint and repair work. Why should I take my car to your shop? Your car is the second largest investment you are likely to make. Preserve its value and your safety by having it repaired professionally. Should I drive my car after an accident if it's drivable? Yes, not only do we offer free estimates, affordable prices, match competitor coupons - we also offer our customers with a lifetime warranty. Contact us today for more information! Am I required by law to get a second appraisal? Do I need to go to a repair shop required by my insurance company? Why did I receive two different estimates? Differences in repair estimates are common. A lower estimate may not include all necessary work. If you are not sure why one estimate is different from another you've received, please ask us. How do I know what shop to pick and if they will be reliable? Choose a shop that has unibody repair equipment and certified (by I-CAR or ASE, for example) technicians. Ask if the shop will be using genuine manufacturer (OEM) replacement parts. Ask if the shop offers a repair warranty. Can you help me negotiate my insurance claim? Yes, Let us help you negotiate your claim with the insurance company.